U10 - small, low cost temperature and humidity loggers with internal sensors. U14 - temperature (both internal or external sensor versions) + humidity logger with LCD value Display. Temperature & Humidity Data Logger with LCD display for indoor use. Configuration and Data transfer via Bluetooth to iOS or Android devices. 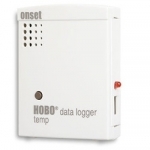 The HOBO U14 LCD Temperature/Relative Humidity (RH) Data Logger displays and records temperature and humidity conditions. The Loggers LCD Display shows the real-time values and unit status. 4-input State/Pulse/Event/Runtime Data Logger for state changes,electronic pulses and mechanical or electrical contact closures from external sensing devices. 4-input State/Pulse/Event/Runtime Data Logger for state changes,electronic pulses and mechanical or electrical contact closures from external sensing devices. Expanded Memory - 4 million measurements. State/Pulse/Event/Runtime Data Logger for state changes,electronic pulses and mechanical or electrical contact closures from external sensing devices. Light On-Off Data Logger for monitoring indoor light changes via an internal sensor. Ideal for Energy Audits and Light usage analysis. Motor On-Off Data Logger for monitoring motor running time, either by recording external contact closures or by using the internal AC magnetic field sensor. Ideal for tracking runtimes of pumps, compressors, generators etc. Occupancy & Light data logger for monitoring room occupancy up to 5m away plus indoor light changes, to identify occupancy patterns and determine energy usage, possibly highlighting potential savings. Occupancy & Light data logger for monitoring room occupancy up to 12m away plus indoor light changes, to identify occupancy patterns and determine energy usage, possibly highlighting potential savings.